2015 will see the UK’s largest renewable energy event move to a new home in Glasgow. Like Aberdeen, Glasgow understands the strategic importance of renewable energy and is rapidly emerging as a leading international hub for energy expertise, particularly due to its well-developed R&D and technical engineering capabilities. 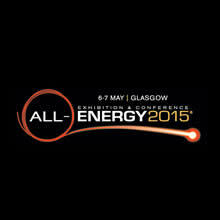 All-Energy 2015 will be held at the SECC in Glasgow on Wednesday 6 – Thursday 7 May 2015. Pamela Stevenson on 03451 555555 ext 473821.